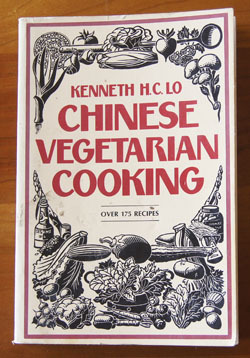 Cookbook #192: Chinese Vegetarian Cooking, Kenneth H. C. Lo, Pantheon Books, Random House, NY, 1974. So reads the introduction to this 1974 book. By 2017, much of the mystery about Chinese cooking has been dispelled, and Americans have adopted many Chinese dishes: stir-fries, steamed and fried dumplings, egg rolls, hot and sour and egg drop soup, fried rice . . . dishes part of our restaurant and home culinary fair. 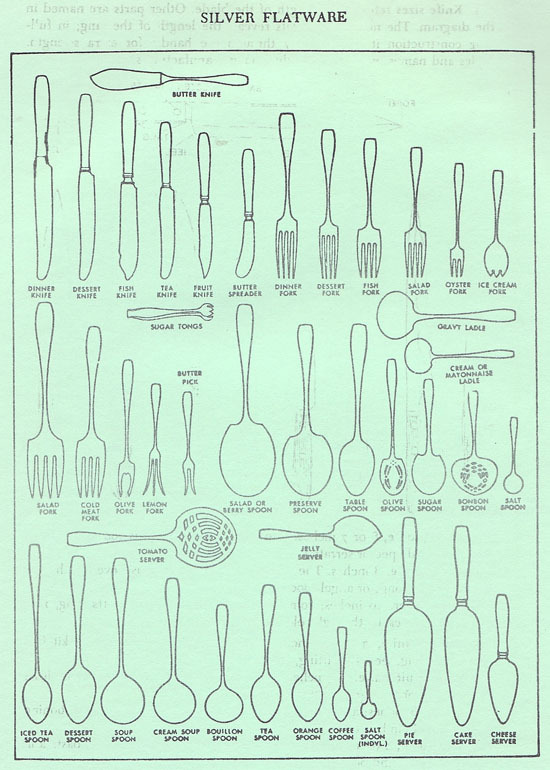 Lo wrote over 40 books on Chinese cooking from the 1950s to the 1990s. According to the back cover of Chinese Vegetarian Cooking, he was also a news commentator for the BBC, a diplomat, a fine-arts publisher, a champion tennis player, and a food critic. He certainly knows a lot about Chinese cooking and culture! It’s evident in every page of Chinese Vegetarian Cooking. I search the internet to see if had a web site, and perhaps recipes that are not 40 years old. No such site exists. I did find from a 2015 bibliography entry stating that he has passed away. I was pretty proud of myself! I picked up a package just to see what it tastes like. Heck, it only cost 99 cents! So what shall I make for this blog? As I page through Chinese Vegetarian Cooking, none of the recipes look familiar, and none are marked. 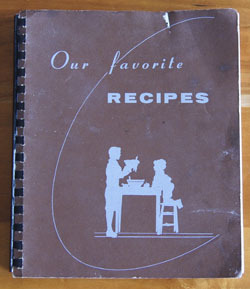 I don’t think I’ve ever cooked any recipe from this cook book, although I’ve owned it for forty years. When I make pot stickers and dumplings and soups and egg rolls, I use recipes from other of my Chinese cookbooks. But I have to find something! After a lot of searching, I choose to make Chinese Salad. I pick up some bean sprouts for this salad at the Asian Seafood Market. I really like that this market sells bean sprouts in bulk – most stores sell them in packages, and the two of us can never finish them before they go bad. I don’t find chives, but pick up a bunch of green onions; these too are always good a the Asian Seafood Market. I get some ginger, and a big baggie of peeled garlic ($1.50!). 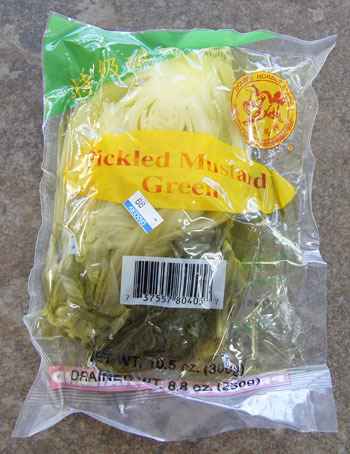 I decide to put some of the pickled mustard greens in the salad to see what they taste like. I don’t have and sherry, but decide to substitute with a little rice wine vinegar. It’s not in the salad, but I buy a big bag of bok choy (the storeowner always gives me grief when I just buy a couple bok choys). Place the romaine, carrots, tomato, bean sprouts, and green onion tops in a bowl. Heat the oil in a pan, then add the onions, garlic, and ginger; stir fry 1 minute. Put the mixture in a small bowl and whisk in the water, hoisin sauce, soy sauce, rice wine vinegar, and sesame oil. Toss the salad, then plate on two dishes. 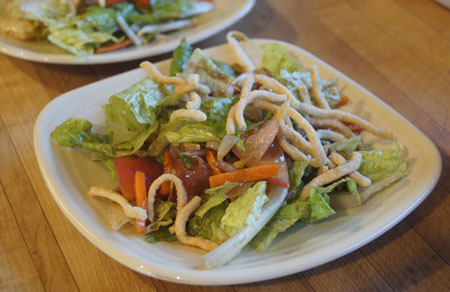 If you like, top each salad with a few crunchy chow mein noodles. Here are the items I bought at the Asian Seafood Market. 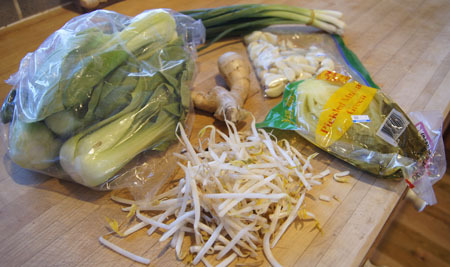 Note how fresh the bean sprouts are! I used the bok choy in a stir fry to go along with the salad. The salads were a success. 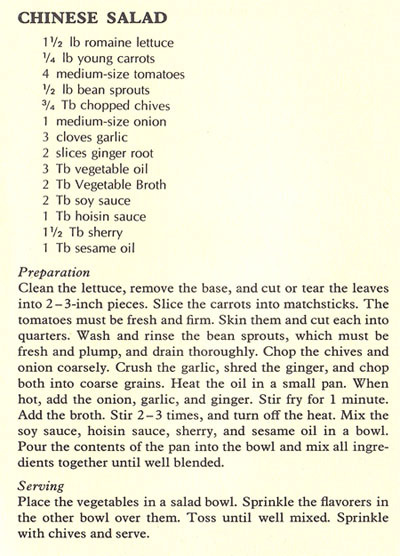 The dressing is good – probably better than store-bought “Oriental salad dressing”. The dressing was also easy to put together and it was quick and convenient to make enough for just two people. Of course, vary the salad ingredients to whatever is on hand! Although this recipe was a success, I will recyle this cook book. Can’t find any other recipe in it I’d like to try, and I have other proven references/recipes for Chinese ingredients and dishes. 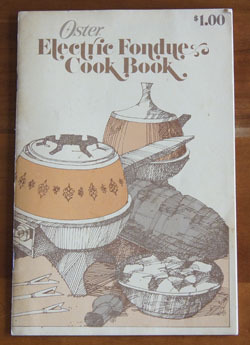 Cookbook #191: Electric Fondue Cook Book, Oster Corporation, Milwaukee, WI, 1976. That lovely decade when my husband and I were in our twenties . . . many memories. Among those memories are certain yummy and often fattening foods. Like fondues. Our party friends with us, the fondue pot filled with a beer-cheese-spice mixture, big, slurpy, cheesy mouthfuls scooped up by homemade tortilla chips. Back in the day. It was fun. That’s when the Electric Fondue Cook Book came into my collection. 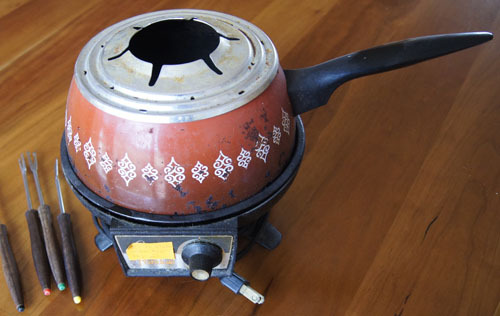 Our electric fondue pot – and we still have it! – was a gift from a friends-couple. The cover says the book cost $1.00, but actually it came with the appliance. I’ve made cheese fondues, and maybe Oriental hot pot fondues. I like dessert fondues, but only when other people make them (!). Beef fondue? Made it zillions of times. That’s the kind where diners cook their own beef cubes in hot oil in the fondue pot and dip the cooked meat in sauces. To this day, it’s still one of our favorite meals. It makes us take more time at dinner, eat slowly, enjoy the food and each others company. 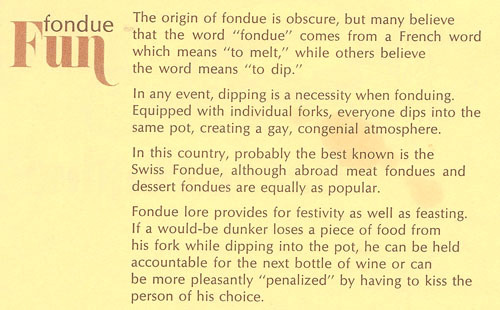 The Electric Fondue Cook Book is short, but has useful, relevant instructions and recipes. The first chapter covers Classic Swiss fondue. Cheese fondue ingredients are garlic, white wine, kirsch, and Swiss cheese; dippers can be bread chunks, meats (ham, meat balls, shrimp), or vegetables (potato cubes, celery, green peppers, cherry tomatoes). Chili con queso, American, and pizza fondue recipes are variations on the cheese fondue theme. Meat fondues “make cooking as much fun as eating”. The cooking liquid is either oil (Fondue Bourguignonne) or a broth (Fondue Orientale). Since hot oil presents special cautions, I appreciate re-reading the instructions in the Electric Fondue Cook Book. The cooking oil can be strained and saved for re-use; to clarify re-used oil, put a few pieces of raw, peeled potato into the heating oil. One of the most important things to remember with hot oil fondues is the safety of the guests, especially when serving directly on the dinner table. Since the pot is electric, there is a cord running to an outlet (and perhaps also an extension cord). We always wrap an extension cord around the leg of the table and even secure it under the leg, then attach the fondue pot. That way, if someone trips over the extension cord, it won’t also knock over the very hot oil in the pot. Gotta watch out for those rowdy little kids around the table. The next chapter is “Sauces”, a good collection of dipping sauces for both hot oil and hot broth fondues. Dessert fondues include chocolate (bittersweeet, sweet, chocolate chip, mocha), butterscotch, and caramel-rum. Dippers can be fruits (pineapple, strawberries, apples, dates, etc. ), marshmallows, angel food cake, cream puffs, doughnuts, or large types of nuts. 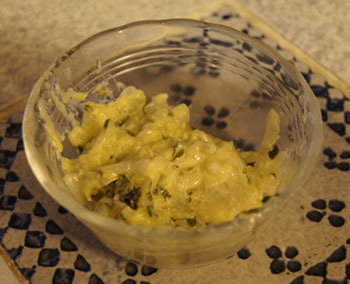 I decide to make Bearnaise Sauce for beef fondue for this blog. I scanned in the whole page that has this recipe to show you how well-used it is! This recipe calls for “hollandaise sauce”. Most of us know that this is a classic sauce made by skillfully emusifying melted butter, egg yolks, and lemon juice. The problems are, the sauce has to be made just before use – it does not hold together long. For instance, you can’t make eggs benedict by preparing the sauce the night before. 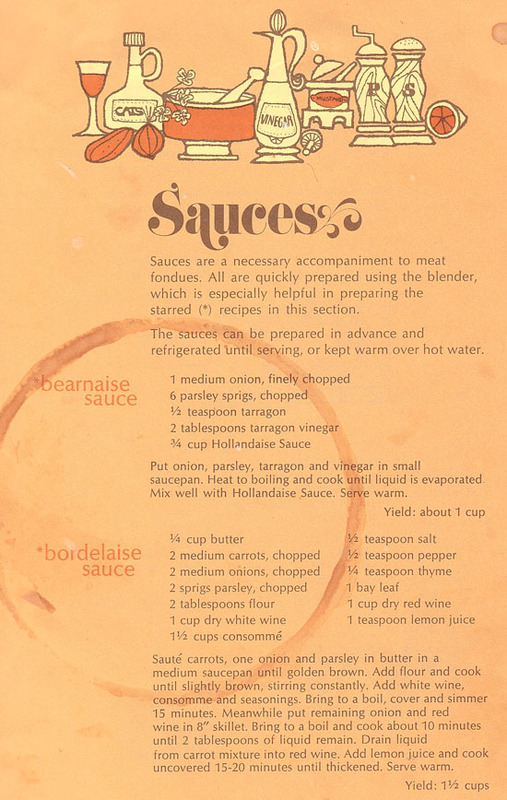 (I can make hollandaise – I became extra good at it when I took a class on “Sauces” at Escoffier Boulder.) The other problem is that recipes for hollandaise make a lot of sauce because you need enough hot butter to cook the egg yolks. I only need a small amount of hollandaise, as I only need enough bernaise sauce for two people. Hollandaise sauce in a jar is available (as per a google search), but I could not find it in any of my local markets. So, I default to my old quick and easy (cheater’s?) 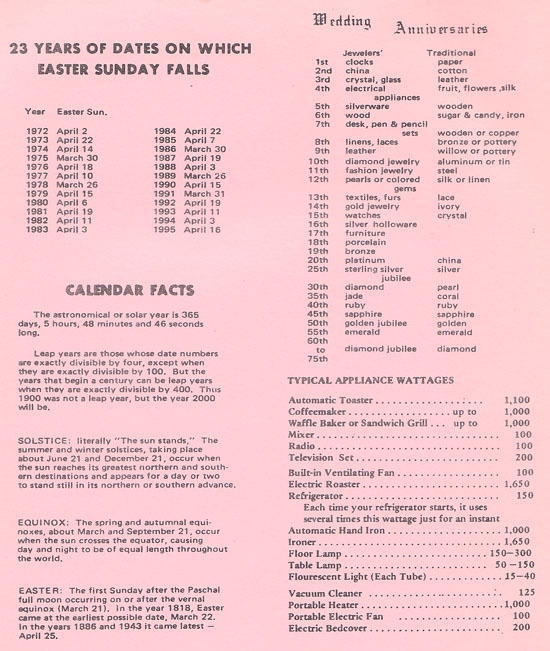 recipe for “blender hollandaise” from the Joy of Cooking. The authors claim that this hollandaise can be held in the refrigerator or even frozen and then warmed up in a bowl of hot water just before use. The bearnaise sauce calls for “tarragon vinegar”. In the past, I know I never looked for this specific vinegar in a market (and I’m not sure how available these oils were in the 1970s). Luckily, I learned how to make herbal vinegars when I covered Michael Chiarello’s Flavored Oils and Vinegars. Briefly, you put in a blender equal amounts of herb and vinegar, and then strain. It’s ready to use right away. I made this recipe (full recipe hollandaise, half recipe bearnaise) but it did not turn out good enough to re-copy into this blog. I made the tarragon vinegar, and while it’s a petty color, it really isn’t worth the extra effort when I only need 2 tablespoons for this recipe. Instead, I highly advise fresh tarragon in the onion mixture if you want to make bernaise sauce. I used 1/2 onion for my half-recipe, but this is still too much onion. I advise a couple tablespoons of chopped onion, or use a shallot instead. My hollandaise was okay, but I used unsalted butter and I should have added a lot more salt. When I added the hollandaise to the onion mixture directly in the hot onion cooking pan, the eggs “cooked” and the sauce lost its velvetiness. Suggestion: Next time I make bernaise sauce, I’ll use my tried and true bernaise sauce recipe instead of trying to shortcut! I doubt I’ll make it for fondue though (unless we have guests). Note: For beef fondue, we usually dip our cooked beef chunks in a simple homemade sauce, like a red sauce (tomato sauce, horseradish, worcestershire) or a creamy sauce (sour cream, worcestershire, ketchup). 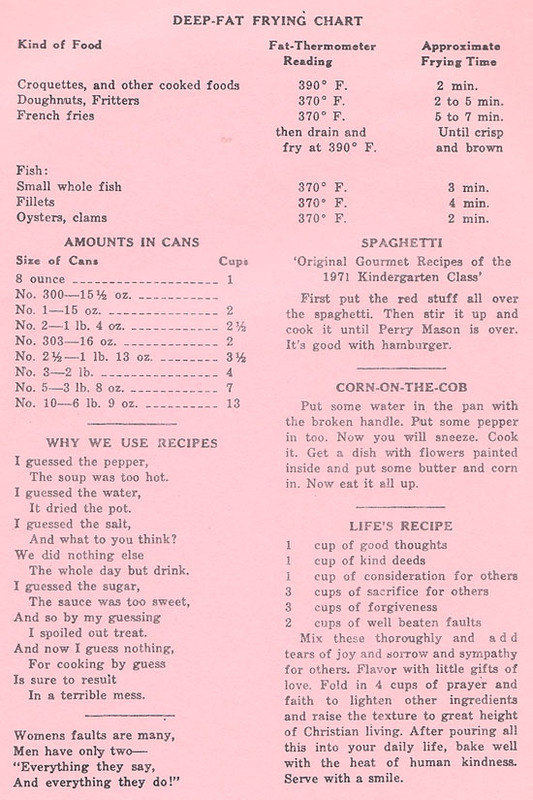 Cookbook #190: Our Favorite Recipes, compiled by the Student Letter Exchange, Walter’s Publishing Company, RFD 4, Waseca, Minnesota, circa early 1970s. I am clueless as to how this book entered my collection – maybe it was my mother-in-law’s, maybe it was at Walnetto in Boulder where we lived for a year or so. And there is more! I giggle over most of the page below, but the amounts in cans is actually quite useful. Some older recipes call for a “No. 1 can” of an ingredient, a nomenclature only rarely used these days. Our Favorite Recipes chapters include appetizers, bread and rolls, cake and cookies, desserts, jellies and jams, main dishes, soups and salads, vegetables, and miscellaneous. What can I say about the recipes? They reflect the cooking of America in the 1960s. 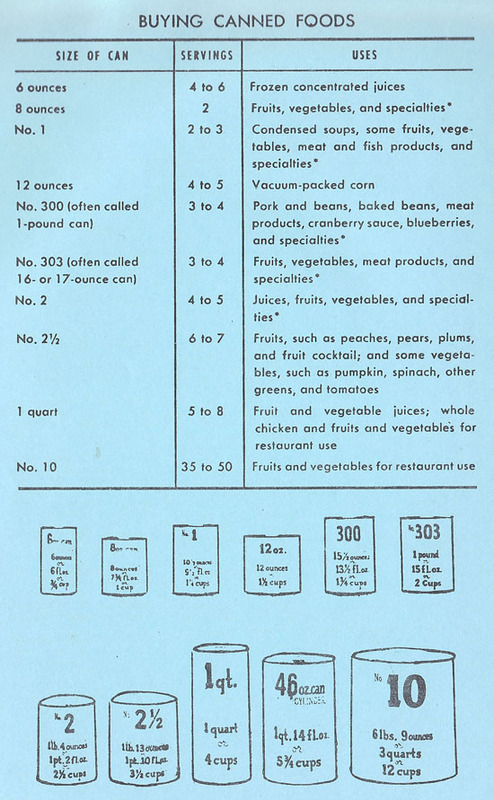 Lots of canned soups and fruits, lots of sugar and shortening. I have a hard time finding a recipe I’d even like to try for this blog. 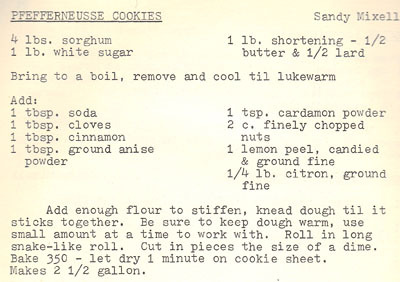 I kind of wanted to try the recipe for Pfefferneusse Cookies, as I was reminded of this old favorite of mine when I covered volume 9 of the Encyclopedia of Cooking. But, the recipe calls for 4 pounds of sorghum. Hmmm. Bumsteads! A bumstead is tuna salad and cheese mixture that is placed in hot dog or hoagie rolls, wrapped in foil, and baked. I used to love these! But I had forgotten what they were called and could not search for a recipe. I decide to make “Monkey Bread”. I’ve made monkey bread before, but this recipe includes mashed potatoes, so I’d like to try it. Monkey bread is a yeast dough that is rolled out and cut into diamonds, dipped in butter, and put in a baking pan. It can be sweet with the addition of cinnamon and sugar, or savory with the addition of garlic and herbs and cheese. 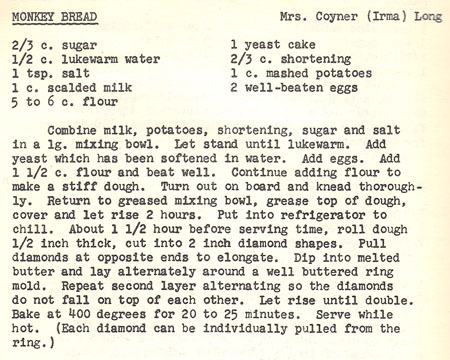 I think there is a bit too much sugar in this recipe, I prefer butter to shortening (and less), I will use active dry yeast yeast, I want to make only half a recipe, and I want to use my breadmaker. My version of this recipe is below. When the rising cycle is completed, roll the dough out to about 1/2-inch thickness. Melt about 1/4 cup butter. Cut the dough into diamond shapes about 2-inches long. 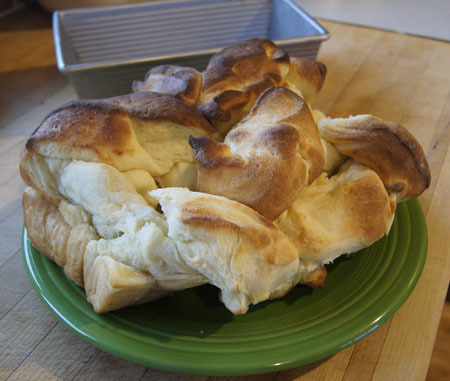 Dip the dough pieces into the melted butter, and put them in a pan (I recommend a bundt pan rather than a large loaf pan – see my photo below). Let rise in pan about 30 minutes (although I am not sure this step is necessary). 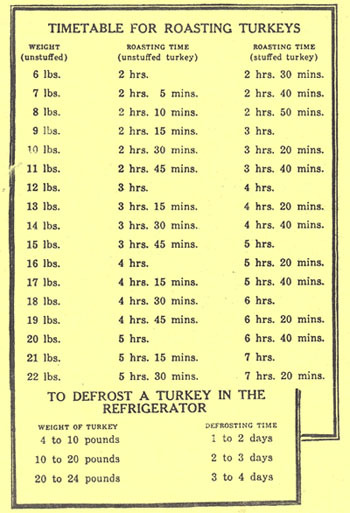 Bake at 375˚ for 25-30 minutes, or until well browned. As you can see, my bread rose crazily! That’s why I suggest a bundt pan next time. Usually a 9×5-inch loaf pan is big enough for 2 1/2 cups flour – but this time it obviously wasn’t! This monkey bread was delicious. Soft and buttery. Yes, I’d make this recipe again, but I’d cook it in a bundt pan. Shall I keep this cookbook? Not sure. I’ve scanned in the pages I want, so I may recycle it.